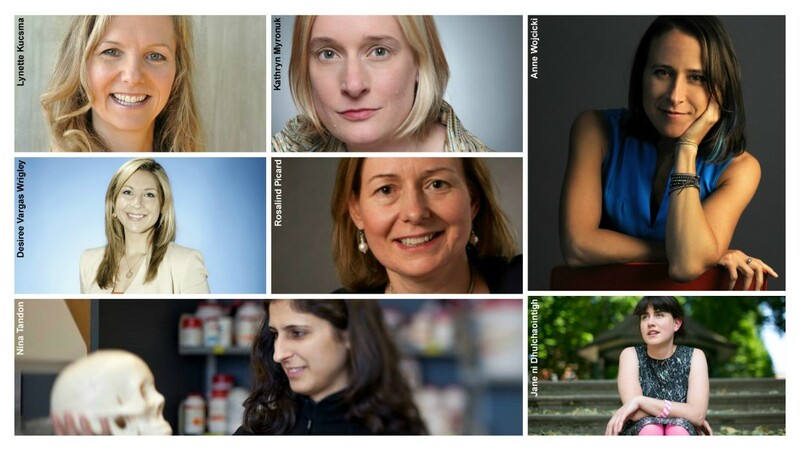 If anyone was going to create a time machine that could tell us the big tech inventions of 2015, it's these women. From a super strong moldable glue, to 3D food printers, and laboratories growing human bones, these are the big ideas from some of science's brightest minds. These seven "tech superheroes" are set to have a major impact on our lives in the next 12 months, according to Shivvy Jervis, creator and presenter of innovation series, Digital Futures. She predicts the ones to watch in 2015. Shivvy Jervis, creator and presenter of innovation series, Digital Futures. Who: Rosalind Picard, co-founder of computing and human analytics start-up Empatica, and researcher at the Massachusetts Institute of Technology's media lab. Big idea: A smartwatch, called "Embrace," that uses sensors to gauge the wearer's stress levels and provide medical readings. Why it matters: The prime purpose of this nifty device isn't merely to tell us when we're feeling irked. It is aimed at those with epilepsy by helping detect convulsive seizures. Who: Desiree Vargas Wrigley, co-founder and CEO of crowdfunding medical platform, Giveforward. Big idea: A website dedicated to crowdsourcing medical expenses which has so far raised over $100 million. The money goes towards things such as travel for medical treatment, equipment, "bucket lists" for terminal illness, and funeral costs. Why it matters: It opens up the power of the masses to those who desperately need funding for critical medical treatment. New material "Sugru" allows users to "hack their products." Who: Jane ní Dhulchaointigh, inventor of new material Sugru. Big idea: A moldable glue, called "Sugru," that sticks to anything from glass to wood, and turns into a strong, flexible rubber overnight. Why it matters: This self-setting material allows people to "hack their products" -- modifying, fixing, and generally making regular objects better. Added to that, Sugru is waterproof, adhesive, and heat-resistant. Big idea: Described as a "knowledge sommelier" by WIRED magazine, Myronuk helped create Singularity University in Silicon Valley -- an organization devoted to studying how different technologies will affect the world over the next decade. Why it matters: Myronuk's focus is on unearthing and forecasting the truly high impact ideas that will shape our futures. She specializes in rapidly changing technologies. &quot;Foodini&quot; is a 3D food printer. "Foodini" is a 3D food printer. Who: Lynette Kucsma, co-founder of Natural Machines, a company that makes 3D food printers. Big idea: Foodini -- a 3D printer that creates everything from pasta, to burgers, and macaroons. Users simply load the ingredients into steel capsules, and watch them squeeze out as complete meals. Why it matters: This clever kitchen appliance brings together the worlds of design, food and technology. Big idea: EpiBone, the world's first company growing living human bones for skeletal reconstruction. Why it matters: This pioneering technology uses a patient's own stem cells to construct a defect-free bone graft to correct that patient's specific bone problem. It aims to provide bone grafts that will provide exact defect repair and shorter recovery times -- all without the complications of foreign body implantation. Anne Wojcicki, founder of 23andme. Big idea: One of the world's largest databases of genetic information about individuals -- allowing consumers to have access to their own genetic information and commercial and academic researchers to better understand and develop new drugs and diagnostics. Why it matters: By virtue of being web-based, it is greatly economical and has reduced the high costs associated with research spending. Read: Who are your Leading Women of 2014? More: The first 'troll-proof' website?